Take home the Gretsch G5420T Electromatic single-cutaway hollowbody electric guitar to get that unmistakable Gretsch twang. 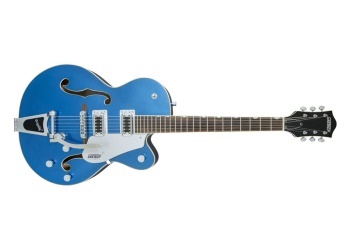 Incredibly affordable, yet laden with professional features, the G5420T Electromatic single-cutaway hollowbody boasts vintage-voiced Gretsch "Black Top" humbucking pickups, an Adjusto-matic bridge, and a Bigsby B60 tailpiece for the subtle pitch modulation that has become synonymous with Gretsch. Three-way pickup switching and four controls, including a master volume, ensure you'll have no problem conjuring the legendary tones the G5420T hollowbody was built for.